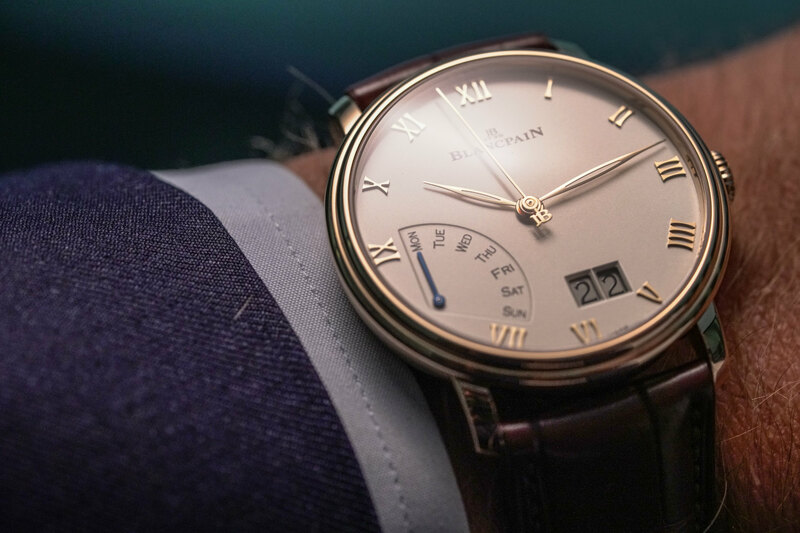 Named after Blancpain’s picturesque Swiss village home, the Villeret collection represents the spiritual heart and soul of the brand. 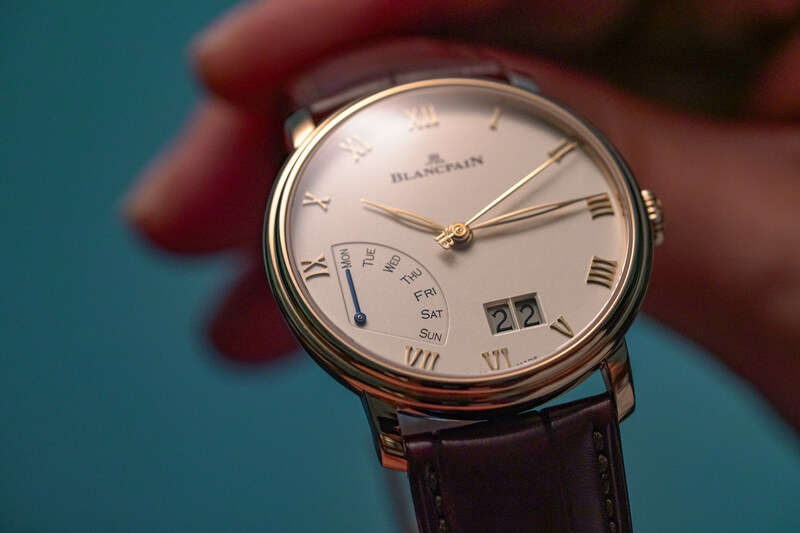 Marking the point at which the Maison’s centuries-old elegance meets modern-day innovation, with each model designed with pure lines, slim case profiles, and clean dials that embody the enduring respect Blancpain holds for traditional watchmaking. The latest addition to the Villeret family is the Grande Date Jour Rétrograde, which, if your French happens to be tres magnifique (and much, much better than mine), you may already recognise as a classical Villeret with both a large date and a retrograde day display. The very first time we’ve seen a retrograde indicator used for the day of the week in the Villeret collection, the display fans out from 9 to 7 o’clock, snapping back from Sunday to Monday with the beginning of each new week. While sitting asymmetrically, just opposite, are dual Grande date windows that, along with the blue hand of the retrograde display, instantaneously change at the turning of each new day. This off-centred look adds a degree of interest to an otherwise cleanly styled opaline dial, with golden hour markers fashioned in the familiar Roman numeral style that’s found throughout the entire Villeret collection. That purity and clarity of design is further reflected in the curves and finishes of the 40mm red gold case. With the signature aesthetic of the Villeret’s double stepped bezel visually slimming the 11.1mm thick profile while maintaining a classical dress watch look and feel without being overly conservative. 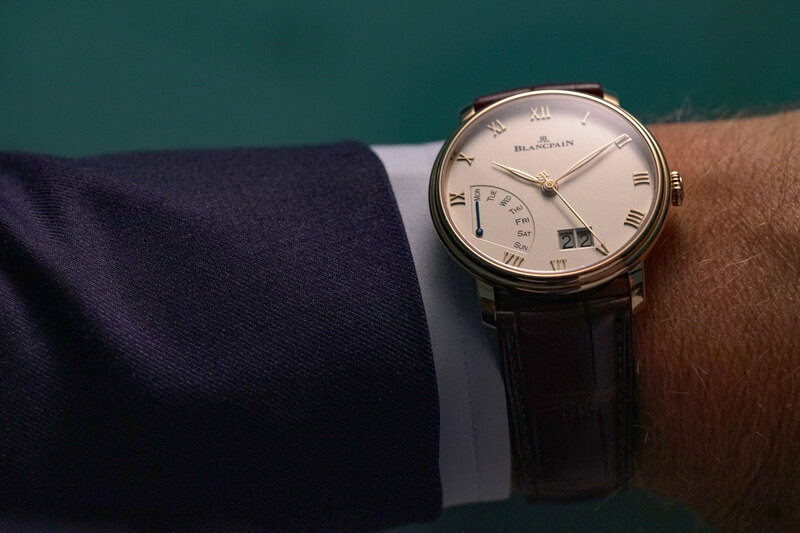 What’s more, the clean curves of the case are preserved by the use of Blancpain’s patented under-lug correctors — allowing the day of the week to be adjusted via a small pusher hidden under the lugs without the need for anything more than your fingertips. Driving the time and calendar complications from within is Blancpain’s new 6950GC automatic movement. 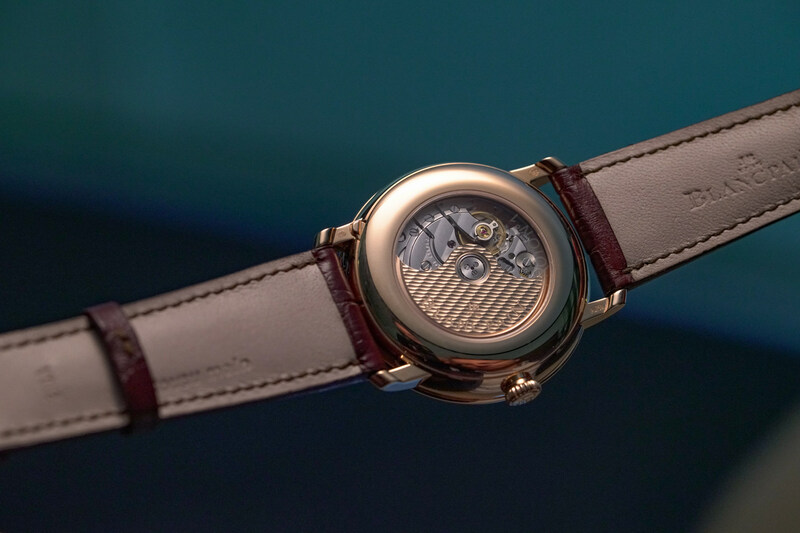 Two mainspring barrels offer a 72-hour power reserve, and wonderful finishes delight the eyes through the sapphire crystal display back, where the movement’s bridges are decorated with fine Côtes de Genève finishes, and a golden rotor ups the texture with a contrasting honeycomb guilloche motif. Refined not just in looks but also in its functionality, the Villeret Grande Date Jour Rétrograde is an elegant choice for the everyday.